Constanze Beckmann’s musical and performance talents were prevalent since her early childhood. At the age of 9, she made her first concerto appearance, performing Haydn’s Piano Concerto in D major. Her early musical maturity was further acknowledged when she had her debut at the Berliner Philharmonie at the age of 11, with Mozart’s Piano Concerto in E-flat major KV 449. Hailing from Berlin, Constanze graduated from The Royal Conservatory of Music under the tutelage of John Perry in 2014 with a double – major in piano performance and economics. Ms. Beckmann has given several recitals in Toronto amongst them she played a concert as part of the Holocaust Education Week 2010 featuring pieces by composers who survived the Holocaust. Constanze forms a regular duo with Canadian- Lithuanian violinist Atis Bankas and since 2016 they have a trio together with French cellist Damien Ventula. The Potsdam Trio has toured in Germany, France, Canada, Italy and Lithuania. Currently Constanze is in her 2nd year Master’s program at Manhattan School of Music in New York under the tutelage of Prof. Kawin. As a winner of first prizes and special awards in major youth competitions such as the International Steinway Competition and “Jugend Musiziert“, Constanze has performed in many solo recitals and played with renowned orchestras including the Berlin Symphonic Orchestra, the Kammerakademie Potsdam and the Erzgebirgisches Symphony Orchestra. 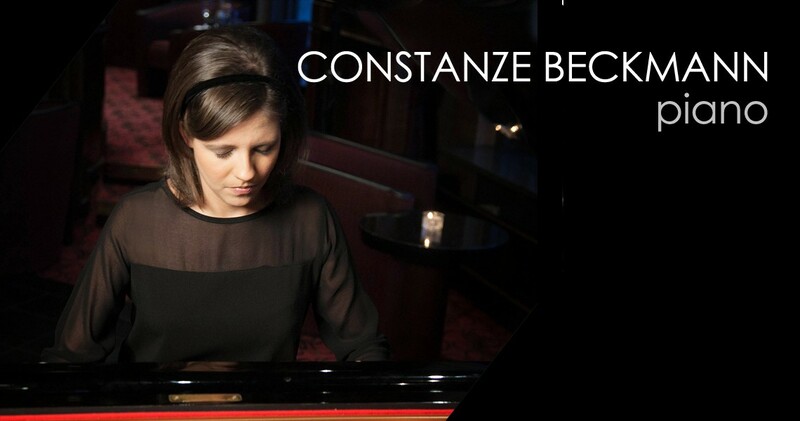 Constanze has performed in master classes for some of the world’s finest musicians, including Leon Fleisher, Arie Vardi, Joseph Kalichstein, John O’Conor and Dmitri Bashkirov. Further mentors include Robert Levin, Elena Richter, Ilana Vered, Sasha Starcevich and Phillip Kawin. She took part in the Beethoven Interpretation Course, “Fondatione Culturale“ Wilhelm Kempff Positano, Italy. Constanze received a scholarship of the “ Deutsche Stiftung Musikleben“. Constanze belongs to an important German artiste family both in visual and musical arts. She was born in 1988. In her pre-school years, she also took violin and ballet lessons. Constanze was put in the early advancement program for gifted students at the “Hanns Eisler“ Academy of Muisc in Berlin and studied piano with Galina Iwanzowa from 1997-2007 and chamber music with Barbara Sanderling from 2000-2004. During her studies at the “Hanns Eisler” Constanze took also lessons for vocal accompanying with Sergio Ciomei and worked with singers from the Komische Oper Berlin, Deutsche Oper Berlin and the Staatsoper Berlin since then.